It wouldn’t be a date... hell, it wouldn’t be the weekend... without cheating death for a few fleeting moments and coming out the other end bolder, stronger, more skilled. 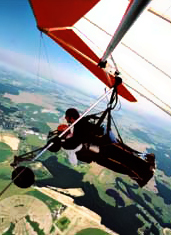 Welcome to Highland Aerosports, a hang gliding outfit that wants to strap you in as soon as possible for a tandem flight over the bucolic Eastern Shore. Without an engine. You’ll head out a few clicks past the Bay Bridge and arrive at this tiny airfield. First up: getting acquainted with your instructor and your trusty bird. You and your instructor will strap in, and then... they’ll attach you to a 250-foot rope, the other end of which is attached to a plane that hauls you 2,500 feet, one mile or 10,000 feet in the air (your choice). Then, quick learner that you are, once the plane releases you you’ll spend anywhere from a few minutes to an hour soaring on the currents, doing battle with menacing birds of prey and, most importantly, piloting yourself down to about 300 feet, at which point your instructor takes over for the landing. If you want to commit to doing this 20 times, along with some schooling on the ground, they’ll even certify you to go solo. Just watch for restricted airspace if you try to fly home.